It's time for my yearly post! Here I am. I'm different, but I still like books and I still like toying with the idea of reviewing them. I would promise you that I'll stick with it this time, but my entire life will get blown apart in a few months, as per the schedule I am unwillingly host to, and I'll have different priorities. I'll always be reading, though. I'm a mother now. And I left my job at the library to allow me to work from home. I'll miss the kids and my friends and being able to abuse the renewal limits, but I feel like I outgrew the place (and the salary). So, now that I won't be bringing a bag of books home with me after every shift, I have decided to focus on reading the many unread books I own. Leaving the house is hard these days anyway. 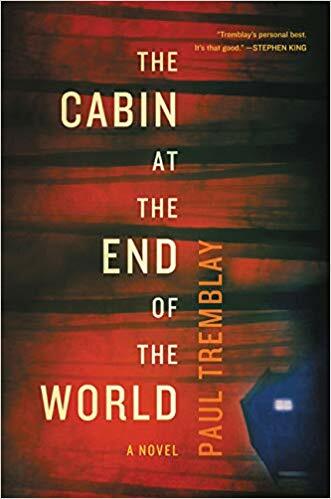 Despite all that, The Cabin at the End of the World isn't a book I own, and is instead a library book I downloaded to my heretofore neglected Kindle. I don't know why I'm like this. After reading Tremblay's A Head Full of Ghosts a few years ago, I was super eager to get my hands on this one. I really need to reread Head Full, as I really can't remember why I liked it so much only that I really, really did and felt delightfully off-kilter and scared at the end, but I was expecting the same from Cabin. Long story short, I did not get what I wanted. Maybe it was the heavy-handed symbolism, the present tense floaty narrator thing, or the forced and weirdly timed character-building flashbacks that served only to remind me of how boring Eric, Andrew, and even little Wen are. I just couldn't get into it. Yet I trudged on, hoping that there was some grand twist that would make all of the boring, aimless scenes make sense. Why did they spend so long shouting at each other through a closed door!? But alas, it was all for naught. There was no twist. All the characters I was interested in died. I found myself rewriting the book in my head as I went along - not a good sign. I will say, though, that this would make a decent movie. The suspense and symbolism would work well on the screen without the clumsy narration telling us where to look. Maybe that was Tremblay's end goal. Oh well! On to the next one. I'm so glad to see a post on this space. Just think: some day you could have Baby Book Puke and review picture books, lol. I didn't realize you're quit your library job, but if it didn't pay well, I'm sure it's hard to justify the cost of day care AND missed time with Baby. Another book blogger friend of mine had a baby about a year ago. She NEVER listened to audio books, but I sort of persuaded her. What she discovered is that while breastfeeding late at night or sitting up with baby, audio books are fantastic. No hands required, and your eyeballs don't have to focus. She's a total convert now. I just saw on Twitter that she listened to four audio books this month alone. Perhaps it's something you'll try? I love thrillers as audio books and really enjoyed Behind Her Eyes by Sarah Pinborough. 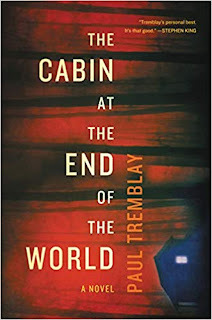 I don't read paperback thrillers, as it's not my jam, but the audio books make all the difference. Want to be notified by email when Book Puke has something new?